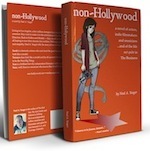 59 actors narrate the 59 Chapters of non-Hollywood, the novel. And you can listen to the full audiobook right here on this site! If you're on this site, you're obviously a fan of indie. Why not check out the novel written by a fellow indie fan? Author Neal A. Yeager has been indie for a long time. "There's that old saying 'write what you know,' and I've been bouncing around the indie scene for quite a few years now. In fact I have the domain nonhollywood.com," he says, "So I thought it would be fun to write a novel about the sorts of characters who inhabit the indie world. The four main characters are: an actor, an actress, an indie filmmaker and a musician all 'aspiring' in Los Angeles. Needless to say, I'm very empathetic." Purchase or preview the novel at any of the usual online stores. And... Listen to the awesome audiobook version (produced completely indie, of course) for free right here on this site!